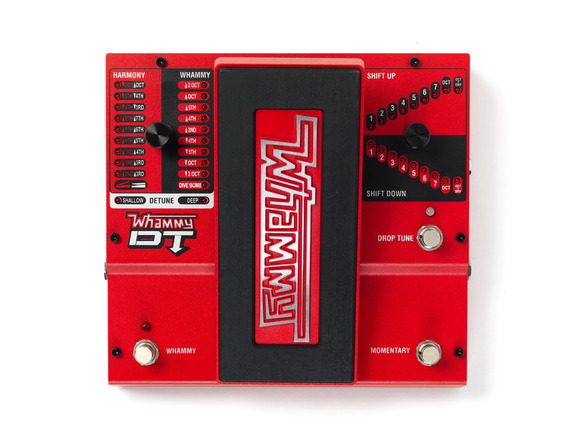 SALT LAKE CITY, Utah -- DigiTech today announced the Whammy DT Pedal is now shipping. The new Whammy DT adds a host of mind-bending capabilities including drop tuning, capo tuning and true bypass coupled with the famous Whammy. Since its introduction, the Whammy DT Pedal has already been met with resoundingly positive reviews from musicians who have had a chance to demo it. "The applications for this pedal are endless. This can be used with any style of music, which makes it so powerful," stated Ben Carter, Guitarist with BC Grooves. "The Whammy DT is not just a one-trick pony; after playing through it, the DT quickly revealed its value as a compositional tool," added Kelly Ritchotte of Luthier. The Whammy DT starts with the classic Whammy pitch shifting effects that have made the Whammy one of the most recognizable effects pedals in rock. Featuring an expanded selection of pitch bending capabilities including nine Whammy bending modes from two-octaves up through two-octaves down, nine harmony bending modes, two detune modes, and the popular Dive Bomb six octaves down effect. The DigiTech Whammy DT is now available with an MSRP of $449.95.